Since bursting on the scene a few years ago, synthetic marijuana (MJ)—often called “Spice” or “K2”—has become the second most popular illegal drug among American teenagers, after MJ. It is especially popular among teenage boys. Sometimes touted as a “natural,” “safe,” and (until recently) legal alternative to pot, this very un-natural class of designer chemicals has shown itself to be a dangerous threat. Thousands of teens and young adults, mostly young males, are ending up in emergency rooms with severe symptoms that may include vomiting, racing heartbeat, elevated blood pressure, seizures, or hallucinations. 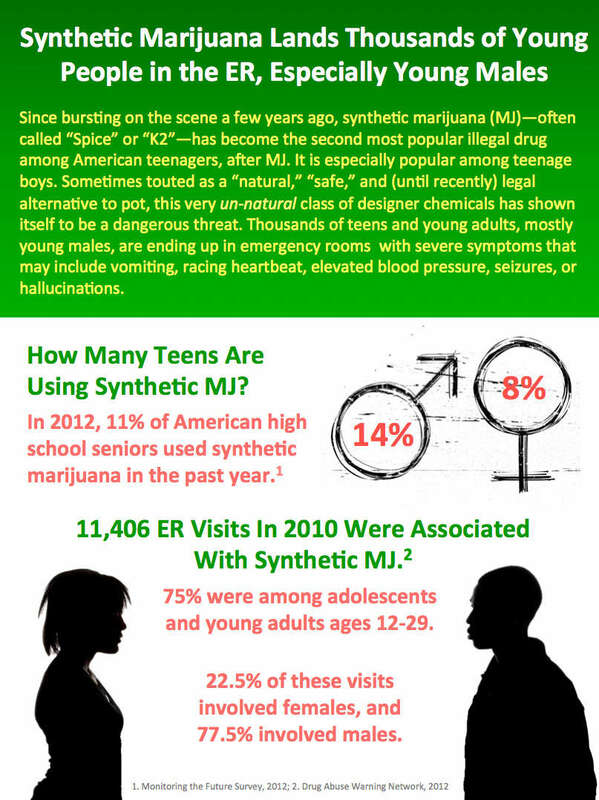 (male, female symbols): By gender, 14% of male and 8% of female high school seniors abused synthetic marijuana. How Many Teens Are Using Synthetic MJ? The BEST Radio Hour with the Task Force!